College is a fun place, no doubt about it. It’s a great place to meet new people, explore different parts of your personality, learn new ideas, and just grow as a person. As fun and challenging and bewildering college may be, it can also be a traumatic place if you get victimized. While there are a lot of violent crimes in college, the most common form that college students experience is property crimes. This can range from your notebook being stolen, to items of clothing, to your backpack, to your laptop, or even your bike. Identity theft is not unheard of in college as well. While we cannot cover all the broad range of property crimes in college and how to protect against them, this post focuses on helping you keep your belongings safe in college. Moving to college means that you will be bringing many of your possessions to school. While many possessions can be easily interchanged and replaced, the damage of having stuff stolen from you is the personal meaning or significance of those items. For example, if you had a ring that your mom gave you or a laptop that you’ve been using for forever and has your personal diaries and all your files, it’s the personal element that’s really victimized by theft. So use this tips to help you keep your belongings safe. This is very basic. College is not like our community back home. Many college students come from very safe communities where people don’t even lock their front or back door because everybody knows everybody. These are great communities to be from, however in the big city (and in college as well), there are many transients and many people who don’t know and care about each other. Bringing these habits to college may mean the difference between losing your property or not. So, lock your room. Also, if you live in a certain type of dorm make sure that the main door is closed as well. You don’t want to send out a message to robbers that your whole residence hall is open and available for theft. Again, some students bring habits from back home by putting the keys under the dorm mat or in the mail box or in any place or location close to their residence. This is a bad idea if you are in college. There are many people that may want to break into your room and steal your stuff so don’t make their job easy by leaving your keys under the mat. Always take your keys. Most colleges don’t have security guards in the library. Unfortunately, many students just leave their stuff on the table when going to the bathroom. Some of them don’t even have a study partner to watch over their stuff. How crazy is that? Don’t ever leave your stuff. Spend the extra minute packing your stuff and putting it in your backpack before going to the bathroom. This is much less hassle than having to file police reports and cough up the money to buy a replacement equipment. Again, never leave your stuff unattended especially in the library or any other public place. If your parents gave you a nice watch or you have a thick wad of cash, don’t show it off in public. You don’t just come off as cheesy, but more importantly, it tips people off that you have stuff they might want to steal. So keep that stuff to yourself. Put money in the bank where it belongs, especially if there’s a lot of it. Then use a debit card so you don’t have to carry a lot of cash always. 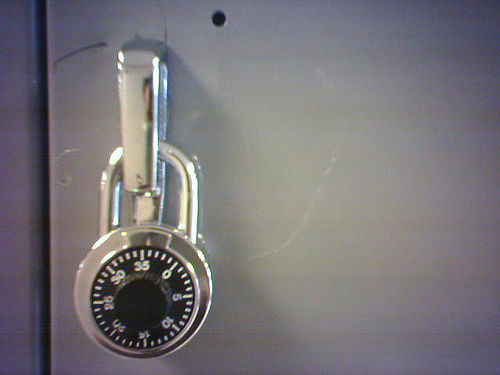 Many laptops already have a lock slot on the side. This is a great feature. You just have to buy a laptop lock and wherever you are – whether at Starbucks, café, library, or dining commons – you can just wrap the lock around the base of the table and then put the end on your laptop. Of course, if somebody really wants to steal your laptop, they can just break the lock but this is harder to do in a public place so always use a locking device. Property crimes happen all the time in college. Don’t become another statistic. Be proactive in protecting your property so you can avoid all the hassles and headaches of having to replace and recover the stuff that got stolen. This guest post was written by Chris Walker, a college personal statement essay writer for IvyResearch.Com, the Internet’s leading source of personal statement examples.